I'm due for Microneedling/Infini RF on Thursday and am understandably nervous after reading all about grid marks and months and months of downtime. A sudden onset of three new pimples has not helped. On the other hand, I read horror stories about subcision, and that wasn't a painful procedure, so I'm hoping this one will go as smoothly as well. Stay tuned for updates. I've been "building up" my skin to withstand the aggressive procedure, with plenty of TLC. Here's what I used up. 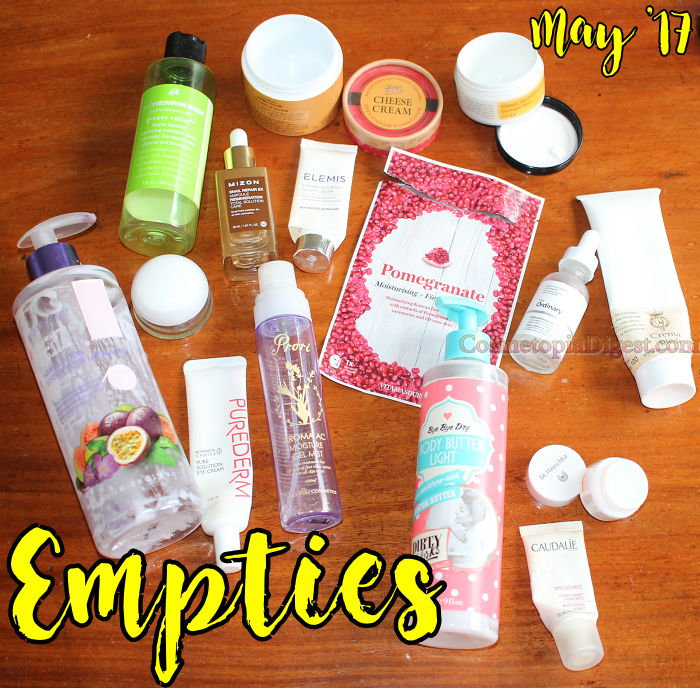 Scroll down for a closer look at the beauty products I emptied in May 2017. Used as a sebum-controlling toner in the mornings. Average. Repurchase? No; there are even better oil-reducing toners out there. Used to reduce post-inflammatory hyperpigmentation, as a spot treatment. Not as effective as my favourite 30% Vitamin C reviewed here, but very cost-effective, and certainly worked far better than expected. Repurchase? Three more bottles in stock. Holy Grail Snail product. Heals post-procedure skin trauma super-fast. Very hydrating. Far superior to the regular Snail Repair Ampoule. A lightweight emulsion, so this goes above the Mizon Ex Ampoule. Good for layering hydration. Repurchase? More than half a dozen 10ml sample tubes left. A gel-mist that claims to control breakouts. It's hydrating, yes, but did not do much to prevent breakouts. Effective and moisturising. Sinks in nicely without ruining pillows. Beautiful and ideal for layering. Non-greasy, healing and soothing so you wake up with non-puffy skin. Light enough to be used every day. Repurchase? I just bought the Ultimate Nourishing Rice version of this pack. Will buy either one after I run out. Sacrilegious statement: I liked this better than the Dear By Enprani Bounce Cheese Cream. It did not REEK of dairy; nor was it as "strand-y", but it hydrated and occluded equally well. I believe Vitamasques and Lassie'el, which I reviewed here, are related, given that they have a very similar product range, and that the latter disappeared right before the former brand was launched. This was a pampering sheet mask which I used after essence, before the ampoule. Repurchase? After I run out. GWP from Sephora Italy, where Biotherm skincare was a bestseller. I wish I had more access to their products - they seem very hydrating. I adore Dirty Works. It's considered a cheaper version of Soap & Glory, but I disagree - this beautiful bath and body brand has definitely come into its own, and this light but moisturising, paraben-free body lotion took care of my reptilian skin over the dry months. Repurchase? After making a dent in my stash. Another beautiful, very affordable brand. I discovered this brand after finding that not all Body Shop products were "against animal testing". This brand is 100% cruelty-free. Also, these are paraben-free, and smell fabulous. Bought from the Basilica di San Paolo in Rome. Had I know how amazing this was going to be, I would have chucked out everything else and brought home a suitcase-full. Repurchase? Cannot, unless I go to Rome each time I run out. 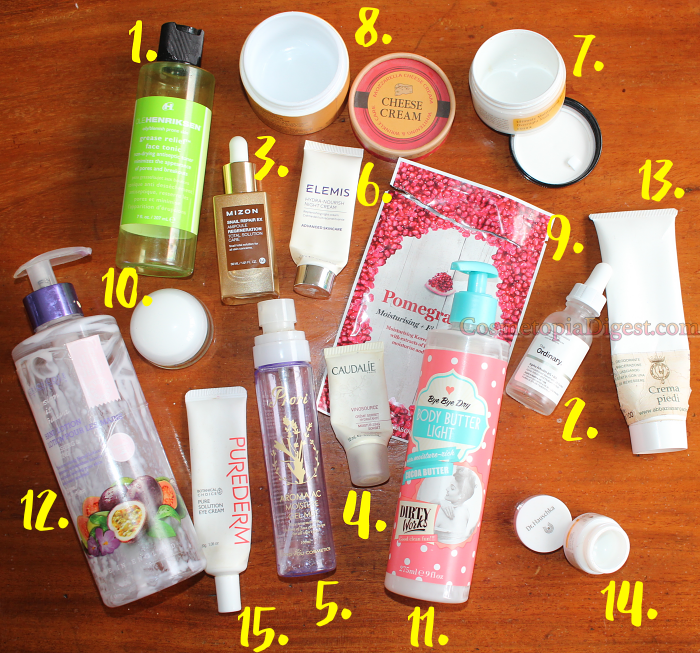 A GWP from somewhere. While this is great for very dry, parched lips, I'm not a fan of lip balm in a pot because it gets everywhere, including between nails, from where it is a pain to dislodge. It took extraordinarily long to use up this large tube of eye cream. While it was hydrating, it did nothing for dark circles or puffiness.